Adapt-N (http://adapt-n.cals.cornell.edu) is an on-line tool that uses a simulation model to incorporate location-specific, early season weather information, as well as soil and crop management inputs, to generate precise N sidedress recommendations for corn. 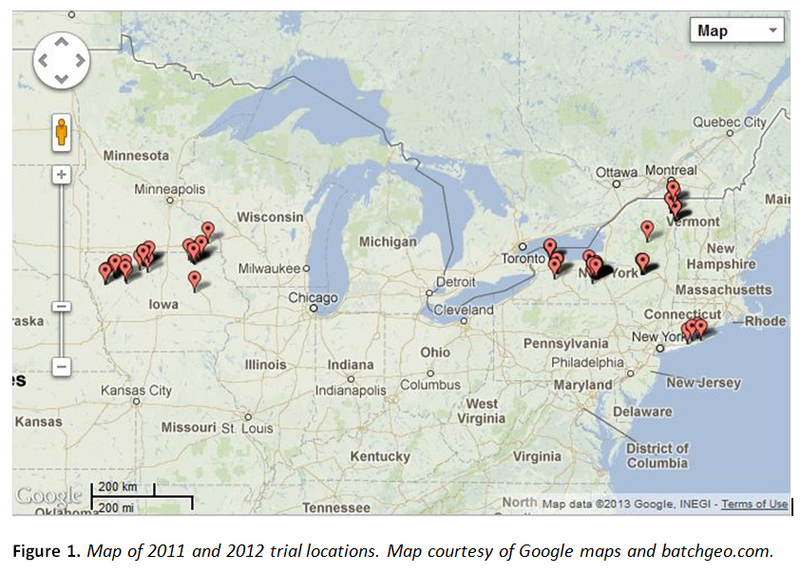 We conducted a total of 84 strip trials in 2011 and 2012 (Figure 1) in NY (56), Iowa (27) and Minnesota (1) to test how well Adapt-N predicts corn N needs at sidedress time. Yield data and estimated leaching losses from all 84 trials show that, when used correctly, the Adapt-N tool significantly increased grower profits and decreased environmental losses. Thus, Adapt-N provided an economic benefit to growers, while also minimizing N losses to the environment in almost all instances. With increasing interest in Adapt-N among growers, consultants, and agricultural service providers throughout the United States and beyond, Adapt-N use has the potential to reduce corn agriculture’s contribution to greenhouse gas emissions, groundwater pollution, and hypoxia in our estuaries, while substantially increasing grower profits. This article summarizes the results of all 84 trials (Table 1, Figure 2) and describes specific trials that provide insights into how to most effectively use Adapt-N.
We completed 18 replicated strip trials in 2011, and 42 in 2012, on commercial and research farms throughout New York. We also conducted 9 strip trials in 2011, and 19 in 2012 on commercial farms throughout Iowa (1 trial in Minnesota is included with the Iowa trials in 2012). The trials involved grain and silage corn in fields with varying management history (i.e. organic amendments, crop rotation, tillage practices, etc.). Sidedress treatments involved at least two rates of nitrogen, a conventional “Grower-N” rate based on current grower practice and an “Adapt-N” recommended rate. A simulation was run for each field just prior to sidedressing to determine the weather-adjusted Adapt-N rate. Yields were measured by weigh wagon, yield monitor, or in a few cases by representative sampling (two 20 ft x 2 row sections per strip). Partial profit differences between the Adapt-N recommended and Grower-N management practices were estimated through a per-acre partial profit calculation. Yields were used as measured, regardless of statistical significance, since the statistical power to detect treatment effects is inherently low for two-treatment strip trials. For corn grain, a 2011 grain price of $5.50/bu and 2012 price of $6.00/bu were assumed. For silage, $50/T was used in both 2011 and 2012, based on reported NY silage prices. A nitrogen fertilizer price of $0.60/lb was used, based on reported NY and IA fertilizer prices. Total N losses to the environment (atmosphere and water) and N leaching losses in 2011 and 2012 were estimated for each treatment through model simulations through October 30 for 2011 NY trials, and through December, 15 in 2012 trials. More detailed descriptions of the 2011 and 2012 methods were provided in previous WCU articles (Moebius-Clune et al., 2012; Moebius-Clune et al., 2013). Profit gains from the use of Adapt-N were considerable. Profits increased in 80% of all NY trials, in 75% of all IA trials, and in 79% of all 84 trials when growers followed Adapt-N recommendations. Profit gains of $27/ac on average ($31/ac in NY, $20/ac in IA) were primarily attributed to fertilizer cost savings due to lower Adapt-N recommended rates without significant yield losses. Profit gains were also achieved in some instances where Adapt-N recommended higher N rates, and consequent yield increases were achieved (3 trials). 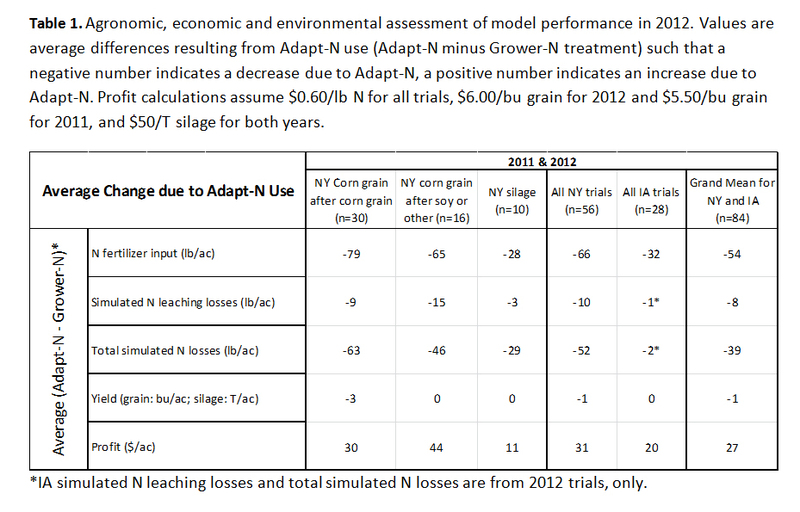 Adapt-N rates resulted in average N input reductions of 66 lbs/ac in NY, 32 lbs/ac in IA, and 54 lbs/ac overall. Yield losses decreased by only 1 bu/ac on average in the 84 trials (a statistically insignificant yield loss), indicating that Adapt-N’s reduced N recommendations were generally justified. Because of the potential impact of field variability on the results of a single trial, analysis of all 84 trials provides the most meaningful assessment of Adapt-N performance and likelihoods for improving grower profits. A look at specific trials can provide insight into effective use of the tool. 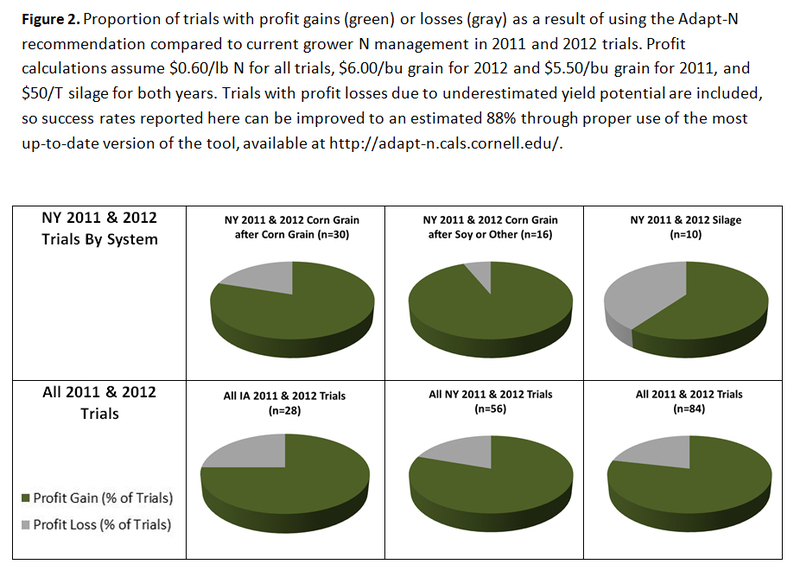 Yield losses (not always statistically significant), and sometimes profit losses, occurred in several 2012 trials where the user’s ‘expected yield’ input in Adapt-N was an underestimate of the yield achieved with the higher N rate (7 trials in 2012). Adapt-N is a precise tool that already fully accounts for the risks of uncertainty and differential losses from over and under-fertilization. If the yield potential of the field is higher than the ‘expected yield’ provided to the model, Adapt-N is more likely to recommend insufficient N to achieve a higher yield. Therefore, a good estimate of expected yield is crucial to attaining accurate N recommendations. Analyzing 3 to 5 years of yield history to determine the expected yield input will maximize the accuracy of yield predictions and thus improve Adapt-N recommendations. Adapt-N recommended a higher N rate than grower practice in 10% of trials, mostly due to wet spring conditions. In 3 of these 8 trials, the higher N rate resulted in a profit increase due to corresponding yield gains, thus justifying the higher N rate. In the 5 instances where a higher Adapt-N rate resulted in profit losses, unpredictable late-season drought conditions resulted in substantial yield reductions below the expected yield in both treatments. Due to insufficient water availability, the crop was unable to make use of the additional N applied in the Adapt-N treatment, thus the additional N fertilizer cost contributed to profit losses. While such individual situations are not preventable, because post-sidedress drought cannot be predicted by tools currently available, assessment of all trials shows that use of the Adapt-N rate provided increased profitability, while decreasing N inputs, in most cases. In 2011, Adapt-N recommendations in corn-soybean rotations were low due to a deficiency in how Adapt-N implemented soybean N crediting. However, savings from N reductions in 80% of these trials were large enough to compensate for the respective yield reductions. This error was corrected, and no further profit losses occurred in 2012 trials where corn followed soybean (Moebius-Clune et al., 2013). Large N input reductions achieved with the use of Adapt-N can often compensate for small yield losses with the lower N rate. For example in one of the 2012 Iowa trials, Adapt-N recommended 0 lbs N/ac as compared with the conventional N rate of 75 lbs N/ac. Despite a yield reduction (9 bu/ac), the Adapt-N rate did not decrease profit (+$1/ac), due to the large reduction in sidedress fertilizer and operational expense. This trial is one of many that demonstrate that growers currently applying high rates of N can realize significant profit gains by using Adapt-N even if yields are somewhat reduced. Adapt-N reduced N rates by 54 lbs N/ac on average, in 90% of trials, resulting in significant reductions in N losses to the environment. By the end of the growing season, simulated N leaching losses decreased by an average of 10 lbs N/ac, and total N losses decreased by an average of 34 lbs N/ac. In 2012, simulated total N losses and particularly leaching losses of sidedress-applied excess nitrogen remained relatively low by December due to widespread dry conditions during the growing season in NY and especially in IA. Further losses of residual excess N have occurred over the winter and spring months of 2011-2012 and 2012-2013. In silage trials, the pre-plant application of manure, and consequent lower inorganic fertilizer rates at sidedress time, limits the potential magnitude for reductions in N losses in comparison with non-manured fields, although Adapt-N can nevertheless significantly reduce fertilizer application in these systems. Estimate expected yield based on 3 to 5 years of accurate yield information. Use representative manure test results from actual manure inputs to reduce the margin of error associated with manure applications. Create field locations in Adapt-N by discrete management unit. Determine management units by several key factors: i.e. soil type, historical yield data, and organic matter content. Take management unit specific soil samples at least every 3 years to determine an accurate organic matter content value, ideally to a 12” depth. Run Adapt-N on the sidedress date if possible – use the daily alert feature for automatic updated recommendations on all fields. In summary, Adapt-N strip trial results from 2011 and 2012 have shown that using Adapt-N to predict corn N needs at sidedress time provides economic advantages to growers as well as environmental benefits due to more precise management of N. Adapt-N thus provides a strong incentive to shift N applications to sidedress time, ultimately increasing grower profits and reducing N losses to the environment in both wet and dry years. For more information: The Adapt-N tool and training materials are accessible through any device with internet access (desktop, laptop, smartphone, tablet) at http://adapt-n.cals.cornell.edu/. Information on account setup and the recorded 3/21/2013 in-depth training webinar are posted. Adapt-N users can elect to receive email and/or cell phone alerts providing daily updates on N recommendations and soil N and water status for each field location in Adapt-N.
Acknowledgements: The development and testing of the Adapt-N tool was supported through funds from Cornell University, USDA-NIFA Special Grants on Computational Agriculture and the Agricultural Ecosystems Program (U.S. Rep. Maurice Hinchey-NY), Northern NY Agricultural Development Program, a USDA-NRCS Conservation Innovation Program, NY Farm Viability Institute, International Plant Nutrition Institute, and MGT Envirotec. We are grateful for the cooperation in field activities from Bob Schindelbeck, Keith Severson, Kevin Ganoe, Sandra Menasha, Joe Lawrence, and Anita Deming of Cornell Cooperative Extension, from Mike Davis at the Willsboro Research Farm, from Dave DeGolyer, Dave Shearing and Jason Post at the Western NY Crop Management Association, from Eric Bever and Mike Contessa at Champlain Valley Agronomics, from Mark Ochs and Ben Lott at Mark Ochs Consulting, and from Peg Cook at Cook’s Consulting in New York, from Kevin Kuehner of Minnesota Department of Agriculture, and from Shannon Gomes, Hal Tucker, Michael McNeill, and Frank Moore at MGT Envirotec in Iowa. We also are thankful for the cooperation of the many farmers who implemented these trials on their farms. In particular we would like to acknowledge Robert and Rodney Donald for implementing farm-wide trials on most of their fields (Moebius-Clune et al., 2013b). Moebius-Clune, B., M. Carlson, D. Moebius-Clune, H. van Es, and J. Melkonian. 2013. Case Study – Part II: Donald & Sons Farm Implements Adapt-N Rates on Whole Farm, Saves Money and Environment. What’s Cropping Up? TBD. Moebius-Clune, B., M. Carlson, H. van Es, and J. Melkonian. 2013. Adapt-N Increased Grower Profits and Decreased Nitrogen Inputs in 2012 Strip Trials. What’s Cropping Up? Preview. Moebius-Clune, B., H. van Es, and J. Melkonian. 2012. Adapt-N Increased Grower Profits and Decreased Environmental N Losses in 2011 Strip Trials. What’s Cropping Up? No. 2, 22.